This restaurant is on a street near the Rynek Glowny (main square of Krakow). 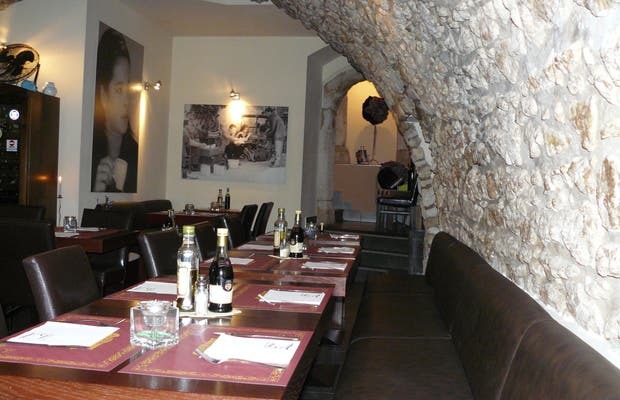 It offers Italian food and many different dishes at a good price. The décor of the place is very strange. Most of the walls are made of stone and large pictures that give it a very special touch to the place. It features armchairs, chairs and sofas, which makes it more enjoyable for lunch or dinner. In addition to the restaurant, the restaurant has a lounge bar, where you can have a coffee or a quiet drink. The music is nice and quiet enough so you can talk without raising your voice. The cleanliness of the place is exquisite in all departments, from the dining room to the bar, past the bathrooms.